I want to extend a huge congratulations to the incredible NewVoiceMedia team, which announced today, that it has been acquired by Vonage. We first partnered with NewVoiceMedia back in 2013. At the time, we’d already had the good fortune of working with several great SaaS companies in categories ranging from HR to marketing automation. We observed that unified communications and contact center software had been a large but laggard category among enterprise cloud adoption. We expected a rapid shift to cloud going forward as enterprises were quickly adopting VoIP telephony and were increasingly bringing Salesforce CRM data into the contact center operations. With this, Anna Khan (then an analyst and now a Vice President at Bessemer) and I set out to find the best team and product in the cloud contact center market. The search led us to NewVoiceMedia’s CEO Jonathan Gale, based in Basingstoke, UK. The first is that I vastly underestimated how much capital it would require to build a successful business in this category. An excellent way to illustrate this is by looking at the scenario analysis we put together around the time of our initial investment. We develop Scenario Analyses in an attempt to predict the various potential outcomes for the company as well as the expected additional dilution over time. 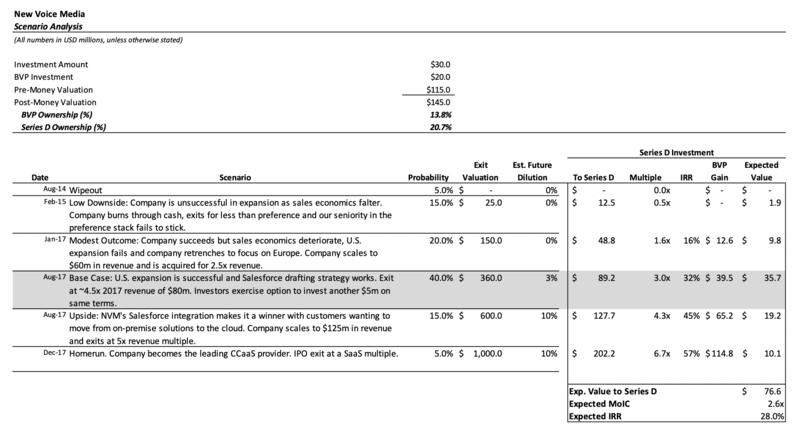 The scenario analysis from our initial NewVoiceMedia investment recommendation is below. We were surprisingly accurate in our estimate for the base case outcome. We predicted that the company would exit at $360m vs. the actual price of $350m. However, we were way off in our estimates for the expected dilution. We assumed only 3% future dilution. In reality, I misjudged the substantial sales and marketing investment required to sell contact center communications product, but while it took a year or so longer than expected, the team prevailed and today serves over 700 customers, across six continents! The second lesson learned is the value of having your executive team physically located in your largest market. This is particularly valuable for many European SaaS companies seeking to expand to the U.S. NewVoiceMedia’s largest market is the U.S. and its biggest distribution partner is Salesforce.com. For many years the executive team was based in the UK, but in 2017 the bulk of the executive team, including the CEO, CFO, VP of Sales, and VP of Marketing relocated to San Francisco and the impact of that transition on the businesses’ trajectory was immediate and substantial. There were undoubtedly many other reasons the team continued to perform and serve their hundreds of customers, but I do think the relocation was very impactful on the company’s growth. It’s worth mentioning that not every company needs to move their executive team to the U.S., and in particular, companies that do not have a substantial enterprise sales force don’t necessarily need to be located in the same market as their customers. My portfolio companies Shopify (based in Ottawa, Canada), and Wix (Tel Aviv, Israel) are good examples of companies that grew to massive scale without any substantial U.S. presence. However, I’m convinced that it’s critical that businesses with an enterprise sales force have a presence in their most important market, and NewVoiceMedia is a great example of the positive impact this transition can have. We’re honored NewVoiceMedia invited us along for this ride and can’t wait to see where they go next with Vonage. Congratulations again to Dennis Fois, Jonathan Gale, Guy Sochovsky and the entire team!